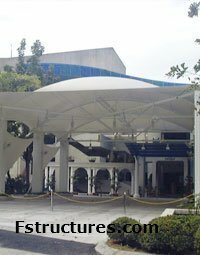 Membrane structures from TENSIONED FABRIC STRUCTURE SDN BHD. 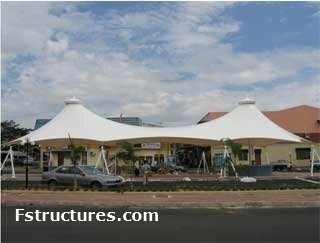 Tensioned Fabric Structure Sdn Bhd has been in the tentage / tarpaulin line for more than two decades, offering a wide range of shade and shelter products for various occasions, from little canopies, umbrellas, free span aluminium structures to special tensioned membrane. The frequency of various meeting being held today prompted Tensioned Fabric Structure Sdn Bhd to penetrate into the highly potential market for membrane roofing industry. We have now developed into a successful and up to date company with a strong local and international networks. With its expertise in high technology, Tensioned Fabric Structure Sdn Bhd has positioned itself as a company with the capability to provide specialised services in the membrane roofing industry. With the rapid development all over the world, more and more meetings are continuously and constantly held, whether in developed or developing countries. This is where Tensioned Fabric Structure Sdn Bhd steps in with its up-to-date hi-tech products to cater for various needs of diverse meetings. Apart from standard structures, the team of architects and engineers in our factories have developed unique membrane tensioned structures with highly innovative designs. In a closely knitted teamwork, our professionals use advanced technology and techniques in the design, engineering, fabrication and construction of membrane tensioned structures which make these structures look superb, sturdy and lasting, while maintaining their beauty and artistic features. Our factories with modern and sophisticated equipment in Malaysia offer specialized services, from initial design, engineering and fabrication to transportation and installation. And since our main priority is our customers’ satisfaction, quality is fully guaranteed. These special structure are most suitable for large architecture projects. With their unique features, custom designed structures are very effective to enhance the environment of resorts, hotels, shopping complexes, sports centres, stadiums etc. With the existence of its factories which are equipped with modern, up-to-date and sophisticated high technology, Tensioned Fabric Structure Sdn Bhd has successfully completed numerous projects involving special membrane tensioned structures. To name a few, we have erected exotic, unique shades and shelter for various locations, including in government and corporate buildings, hotels, resorts, shopping complexes, sports centers, city malls, side malls, side street walks, arcades, etc all over the country. The response and feedback shows the customers' satisfaction because Tensioned Fabric Structure fulfils requirement and desire of its customers.